We knew all along that the passing of Elmore Leonard earlier this week would create a sad stir at our sister publication, the crime fiction-focused Rap Sheet. A tribute to Leonard began rolling out yesterday and readers should keep their eyes peeled for subsequent installments: it’s clearly going to be a Rap Sheet classic. Editor J. Kingston Pierce responds to the sad news in his typical style: partly personal, partly deeply factual and partly shepherding responses from a phalanx of grief-stricken authors who share their sense of loss upon losing a writer who was a hero to many of his kind. Robert Ferrigno, Kelli Stanley, Ace Atkins, Gary Phillips, R.J. Ellory, Bill Crider, Libby Fischer Hellmann and Jason Starr are among those who add their voices to The Rap Sheet’s tribute. 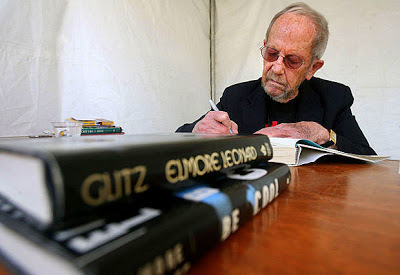 The first part of The Rap Sheet’s massive tribute to Elmore Leonard is here. Part II has now been posted here.